Batavia Moonwalk Rentals are fun for everybody. Located in Batavia, Illinois, Castle Party Rentals is not only local, but also very affordable. We strive to provide the best pricing on moonwalk rentals, the best variety of moonwalk rentals, and the best customer service in Batavia. Many of our employees currently reside in Batavia, IL so we feel that it is important for Castle Party Rentals to positively interact with the community. Also important to note is that Castle Party Rentals not only offers Batavia Moonwalk Rentals, but also tent rentals, table rentals, chair rentals, concession machine rentals, entertainers and much more. If your party will not be held in Batavia, then there is no need to worry. We service the entire Chicago land area outside of Batavia and are really passionate about earning your business as well. Time for some pictures of our Batavia Moonwalk Rentals!!! This is our Mega Fortress Moonwalk Rental. For our Batavia residents, it can be yours for only $145 for the whole day! Plus you get free delivery, setup, and takedown. This is a big 15' x 15' Castle with a safety ramp and very attractive. You can fit about 8-10 kids in this Batavia Moonwalk Rental. This moonwalk is great for children as young as 2 years old, but can support adults. Yes, this moonwalk rental is commercial grade. We only rent inflatables that you can be proud of to display to your guests. Again, this Batavia Moonwalk Rental is only $145 for the whole day and includes delivery, setup, and takedown. If you have any questions about the Mega Fortress Moonwalk Castle, please feel free to give our Batavia, IL office a call at (630)-400-6545. Looking for a themed moonwalk rental in Batavia, Illinois? Then the Medieval Castle Moonwalk is the perfect choice for you. The Medieval Castle Moonwalk Rental, as you can see, has some beautiful graphics on the moonwalk. The graphics are hand painted by a local Batavia artist, specifically a princess, a knight, alligators, a draw bridge, etc. This Batavia Moonwalk Rental is only $155 for the entire day and includes free delivery, setup, and takedown to Batavia, IL. We only carry large 15' x 15' moonwalks so that many kids can jump in the moonwalk at one time, specifically 8-10 normal sized children. This is a commercial grade inflatable moonwalk, so even adults can join their children and have a good time. This Batavia moonwalk rental is equipped with a safety ramp and many other safety features. Castle Party Rentals carries million dollar liability insurance and will opening present you with our proof of insurance. Rent from the best! This is one of the best Batavia Moonwalk rentals that we offer. Not only is it extremely attractive, but it is also very affordable. This Batavia Moonwalk Rental called the Red Turret Castle rents for only $155 dollars for the whole day. We will deliver, setup, and takedown your Batavia Moonwalk Rental anywhere in Batavia, IL for free. If you live in Batavia, we want your business. Our party rental company originated in Batavia, Illinois and consequently we want to give back to the Batavia Community. The Red Turret Castle is a very large moonwalk rental in Batavia. If you are looking for a fun and affordable attraction, then rent this Batavia Moonwalk Rental and your children will be very thankful and bounce on the Batavia Moonwalk rental for hours on end. Check out this moonwalk rental in Batavia, Illinois. It is called the Kingdom Castle moonwalk and rents for only $165 for the whole day. This deal is only available to Batavia moonwalk clients. As residents of Batavia, you will recieve free delivery, setup, and pickup. It's the best deal available in Batavia. If any other party rental company offers you a better price than our moonwalk rentals in Batavia, then we will beat it by 10%. That's how confident we are about our Batavia, IL moonwalk price and product. This Batavia moonwalk rental (Kingdom Castle) is larger than any other moonwalk rental in Batavia. If you are planning a party in Batavia, then Castle Party Rentals should be your top choice. We will do everything to earn your business. Please let us know if we can be of any assistence with your Batavia moonwalk needs. There are a lot of Princesses in Batavia, Illinois. And they all deserve a Disney Princess Castle moonwalk rental for their birthday party. This Batavia, IL moonwalk rental is a large castle that can fit up to 10 children. It is equiped with a safety ramp so that the kids can get in and out of the Batavia moonwalk rental safely. This Batavia moonwalk rental has all your daughter's favorite princesses in the graphics. Girls scream in excitement when they see this beautiful castle moonwalk rental from Castle Party Rentals, a company dedicated to provided the most affordable moonwalk rentals and party rentals to its Batavia, IL residents and clients. If you are looking for the birthday birthday present for your daughter, then renting this princess moonwalk will surely do the trick! Hop aboard this Batavia moonwalk rental and sail away with Captain Jack Sparrow. This is the Pirates Moonwalk that the kids will enjoy for hours on end. This particular Batavia moonwalk rental rents for $175 for the whole day and includes delivery, setup, and pickup in Batavia, Illinois. Castle Party Rentals cleans their moonwalks after each use to guarantee an attractive product. This Batavia, Illinois moonwalk rental is very large, with an estimated size of over 16' x 16'. With such a large moonwalk, you can fit up to 10 children at one time. All of our Batavia moonwalk rentals are commercial grade and can accomodate adults as well. 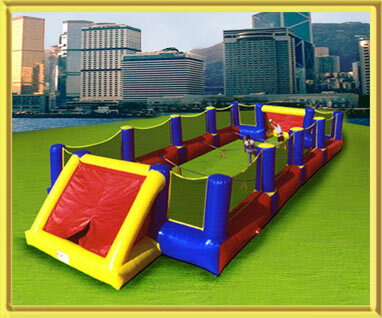 Now, Castle Party Rentals offers an opportunity for children to bounce and enjoy themselves to alongside their children. If you have any questions about any of our Batavia moonwalk rentals in Illinois, please call us at (630)-400-6545. Get Ready. Get Set. Go! Take a victory lap with this Batavia moonwalk rental. Called the Extreme Speed Racer moonwalk, it rents for $185 for the day and includes free delivery, setup, and take down to Batavia, Illinois. This is a very popular moonwalk rental in Batavia. You may have seen this moonwalk in your neighbor's back yard, at your child's local school, etc since it is the most popular Batavia moonwalk rental. The Extreme Speed Racer moonwalk rental is great for School fun fairs, birthday parties, company picnics, fundraising events, and a variety of other celebrations. Best of all, no gas is necessary to bounce and have fun. Thank you for considering Castle Party Rentals for your moonwalk rental needs in Batavia, IL. If you need any additional information, please call our Batavia office at (630)-400-6545 and they can answer all your moonwalk rental questions. Batavia Slide Rentals are one of a kind. Castle Party Rentals now also offers water slide rentals and huge corporate event slides. The weather man is expecting a hot humid summer so why not cool off with Batavia water slide rental. Our Batavia slide rentals come in a variety of shapes and sizes but will definitely attract a large crowd and entertain for hours on ends. Please note that our Batavia Water Slide Rentals require a water source such as a garden house to utilize. Please call a Castle Party Rentals representative to discuss your Batavia, Illinois slide rental or water slide rental. Batavia Charles Obstacle Course Rentals are very entertaining. We not only carry the largest obstacle course rentals in Batavia, but also throughout Illinois. We maintain competitve rates on our Batavia Obstacle Course Rentals, but just to make sure, we have developed our price match guarantee. If you find a similar obstacle course for a better price, we will not only match our competitor's rate, but we will also beat it by 10%. To learn more about this Batavia Obstacle Course Rental policy, please call a Castle Party Rentals representative at (630)-400-6545 and we can work out a price that satisfies your party rental budget and entertainment needs. 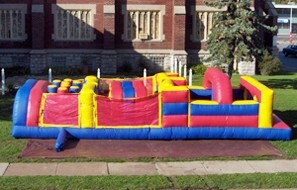 Castle Party Rentals offers many inflatable game rentals to its Batavia, IL customers and residents. The Batavia Game Rentals are very interactive and can entertain children for hours on end. We have boxing ring rentals, mechanical bull rentals, velcro wall rentals. rock climbing wall rentals, bugee run rentals, and much more. Looking for a game not pictured above? Then please give Castle Party Rentals a call at (630)-400-6545 and we should be able to get it for you. Castle Party Rentals offers Batavia Tent Rentals as well. We have tent rentals for all different sorts of Batavia, IL events. We have tents for small dinner parties of 10 people to tents for large corporate functions of over a 1,000 people. We also carry a variety of different kinds of tents in Batavia such as different shapes, colors, and sizes. For all your Batavia Tent Rental needs, please contact a Castle Party Rentals representative so we can put together a great package for you! (630)-400-6545. Our Standard Party Tents are what we suggest for a simple and affordable party. These tents are the most common rental and can also come in a variety of colors such as white, blue, yellow, green, etc. They provide some great shade for your guests and really enhance the atmosphere. These tents are installed with excellence by our trained staff members. These tents will protect you from the rain or shine at an affordable price. Call for tent tentals in Batavia, Illinois. Our High Peak Pole Tents are amazing. They are constructed by Anchor, the most premier manufacteror in the undustry. All of these tents have white tops. Their high peaks can be seen from miles away and they sparkle as they reach towards the sky. Not only do they protect you from the sun, but are quite a site. These are highly recommended for high class events such as weddings, corporate events, festivals, etc. Obviously they can accomodate large crowds. If you are looking for an even larger tent than we have listed, then please give call us for their pricing. Call for tent rentals in Batavia, Illinois. Frame tents are very ellegant, yet very heavy, involve many pieces, and are quite a timely item to install. Due to this, frame tents must be installed by our highly trained staff. Frame tents have no center pole, which provides our customers with a greater amount of space. If you plan to set up a tent on a hard surface such as concrete or ashalt, then such a tent is necessary because it allows us to utilize sandbags. Call for tent rentals in Batavia, Illinois. Our Even Pole Tents are for parties and events that need to cover a lot of people. We offer some of the nicest and most affordable event tents so that you can protect you guests from the heat, the rain, or provide your event with an overall feel of elegance. Our Event Pole Tents only come in the classic white color. Call for tent rentals in Batavia, Illinois. If you need any addition Batavia Tent or Canopy Accessory Rentals, please contact a Castle Party Representative at (630)-400-6545. "Castle Party Rentals is by far the best value. They had everything I needed for my party and I was thrilled to recieve free delivery, setup, and takedown as a Batavia resident." "You guys did a great job at my daughter's birthday party. The moonwalk was a lot of fun and the entertainers kept the attention of the kids the entire time. I will surely refer you to all of our Batavia family and friends!" "I have 4 kids and I can always count on Castle Party Rentals to offer me the best price so that each one of my kids can have a special birthday celebration. We have been a client for many years. When we moved to Batavia, IL last spring, we were delighted to get free delivery, setup, and takedown." We hope that we will have the opportunity to work with you on your Batavia, IL event this year. Please note that we have many other products and services aside from moonwalk rentals. We also rental obstacle courses, inflatable games, mechanical bulls, tents, tables, chairs, linen, bars, casino tables, and much more. For our complete line of products please visit www.CastlePartyRentals.com and use the side bar to navigate through our site. Serving Batavia, IL and surrounding suburbs. Q) Why should I choose Batavia Moonwalk Rentals for my event? A) We are a locally owned, family operated company that has been proudly serving the Chicago land area since 1997. We offer helpful, friendly customer service. 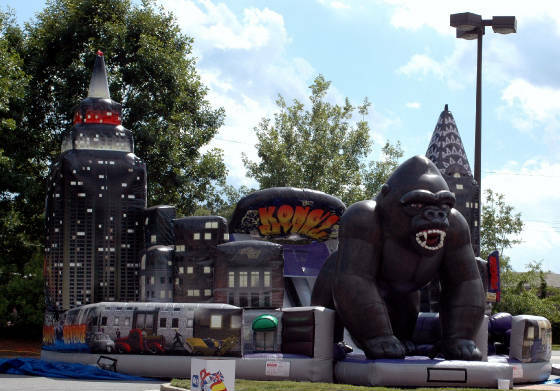 With many different inflatables to choose from, we know that Batavia Moonwalk Rentals can help make any event a great success. Q) How far in advance should I make my reservation with Batavia Moonwalk Rentals? A) The sooner you can make a reservation, the better. People reserve our units weeks and sometimes months in advance. We don't want you to miss out on the fun! Saturday is our most popular day of the week and it books up quickly, so the earlier you reserve the more choices you have. Call Batavia Moonwalk Rentals to see if you inflatable are available (630)-400-6545. Q) How much area is needed for my Batavia Moonwalk Rental? Q) what surfaces can my Batavia Moonwalk Rental be setup on? A) Yes. The delivery man should be treated just like your barber, pizza delivery man, and waitress. Just a few dollars to say thank you is all they expect. Delivering your Batavia Moonwalk Rentals is very hard work! Q) Are Batavia Moonwalk Rentals safe? Q) What if I do not have an electrical outlet near the site for the Batavia Moonwalk Rental? A) Batavia Moonwalk Rentals has generators available for an additional rental fee. You may also use one of your own generators. We ask that if your event requires a generator, that you let us know in advance. Q) How much should I pay for a Batavia Moonwalk Rental? A) The larger the unit, the heavier it will be, and the more you will have to pay for it. Also, some units have graphics on them, which may add to the cost. What is great about Batavia Moonwalk Rentals is that we guarantee the best prices in the Batavia, IL area and will beat all competitor prices. If you find a better price on a similar unit, then we will beat that price by 10%. Q) Can Batavia Moonwalk Rentals be left over night? Q) Will the Batavia Moonwalk Rental ruin my grass? Q) Can a Batavia Moonwalk Rental be set up on my lawn if I have a sprinkler system? Q) Does the blower on the Batavia Moonwalk Rental need to be running all the time? Q) Can the Batavia Moonwalk Rental be used in the rain? Q) Do I need an attendant for my Batavia Moonwalk Rental? A) No, but there must ALWAYS be someone responsible supervising the any moonwalk. Batavia Moonwalk Rentals can supply a trained attendant for the charge of $15/hr. Q) Can any of the Batavia Moonwalk Rentals be used indoors? A) In most situations yes. Permission from the Park District may be required. The park district may also require you to purchase additional insurance with is something that we provide. We have a very good relationship with the Batavia Park District and Forest Preserve so you should have no problems. Q) Is a deposit required for a Batavia Moonwalk Rental? A) Yes, however it is minimal. We ask for a $50 deposit for all events under $500 and a 50% deposit for all events over $500. However, we can work around this if any special circumstances are present. Thank you for considering Batavia Moonwalk Rentals. We promise put the bounce into your next Moonwalk Rental!